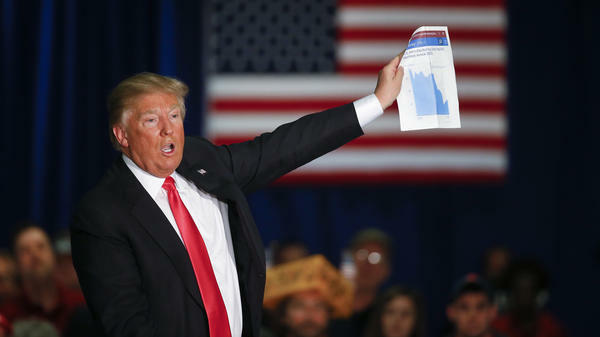 Donald Trump clearly knows the manufacturing numbers; here, he shows a graph on manufacturing while speaking during an April campaign event in Wisconsin. The announcement that President-elect Donald Trump and Vice President-elect Mike Pence helped persuade Carrier to keep 1,000 factory jobs in the U.S. is a pretty big win. After all, they ran on a message of protecting The American Worker, and Trump isn't even in the White House yet. Details about the deal dripped out Thursday morning. United Technologies Corp. (parent company to Carrier) will get $7 million in tax breaks over 10 years, the Wall Street Journal reports, but the Indiana Business Journal adds that the company was also scared of losing federal contracts. Of course, a company-by-company negotiation does not a jobs policy make. This is a tiny symbolic gesture — 1,000 jobs is less than 0.01 percent of the manufacturing jobs in the U.S. Moreover, the country still has about 1.5 million fewer manufacturing jobs than it did prior to the recession. Trump faces a reality that journalists have pointed out over and over, both during this campaign and during the earlier years of the Obama presidency: manufacturing jobs aren't coming back, at least not to anywhere near their prior highs. It's not just about manufacturing, though; economists have been warning about weakness in the middle of the job market for years. That's a challenge any policymaker will have to deal with in the coming decades, and it could require some deep policy fixes. This is called job polarization — the idea that the market for middle-skill jobs has softened, while low- and high-skill jobs have taken off. Economist David Autor and many others have argued that the "routine" jobs in the middle of the spectrum were being automated away. Many of the manufacturing jobs Trump is talking about fall into this category. Here's a chart showing what this looks like. Earlier this year, the Federal Reserve Bank of St. Louis illustrated the difference in growth between those high-, middle-, and low-skill jobs. That top line is professional jobs, which the folks at the bank label "nonroutine cognitive" — things that aren't rote repetition and require a fair amount of thinking and training (being a surgeon or an architect, for example). The middle two are routine cognitive jobs (the green line — think salespeople and secretaries) and routine non-cognitive jobs (many old-school manufacturing jobs, for example). The bottom line is "non-routine manual" work, often thought of as low-skill work — hotel maids, waiters and so on. In other words, the things that we haven't figured out how to automate or offshore yet are the jobs that continue to grow steadily. Those routine jobs the Fed breaks out? They still haven't recovered to their pre-recession levels. Trump just happens to have won counties that have a large share of routine jobs, as economist Jed Kolko pointed out at FiveThirtyEight last month. And while it's true that many factors beyond "economic anxiety" clearly played into people's votes for Trump, anxiety about the future of these jobs may have helped push people into his camp, Kolko writes. This is the economic reality that Donald Trump and future presidents will have to address. From this standpoint, it's no surprise that some of Trump's biggest support came from whites with lower levels of education, given his nostalgic campaign message, "Make America Great Again." "Old-fashioned production and clerical jobs that paid reasonably well to people with only a high school diploma or less, those are disappearing rapidly," said Harry Holzer, professor of public policy at Georgetown University. In 1973, more than two-thirds of jobs were held by people with a high school diploma or less, according to a 2014 report by the Center on Education and the Workforce at Georgetown. By 2020, they project, that will be flipped; just over one-third of jobs will require a high school diploma alone or less; two-thirds will call for some kind of postsecondary education. Persuading one company to keep a thousand jobs in the U.S. is one thing. Crafting (and passing) an actual policy to persuade many companies to stay in the U.S. is another. Trump could potentially get more factories to stay, says Carlos Gutierrez, secretary of commerce under George W. Bush. "If he can do it through tax incentives where companies are building plants in the U.S. because they get a good tax deal, then he won't have to do it company by company, which I think is very unrealistic," he told Morning Edition this week. But a longer-term strategy would be to prepare people for the jobs that will be showing up in the future. Some new middle-skill jobs are in fact starting to show up. The "green jobs" and advanced manufacturing jobs that President Obama has been fond of touting are a few. Some health care assistance professions, like radiology or phlebotomy (that is, people who draw blood at labs or doctors' offices) are also set to grow quickly. Indeed, growth in the middle has picked up a bit in recent years. The upshot, though, is that many jobs in what Holzer calls the "new middle" may not quite require a college degree, but they will require more training than a high school diploma. One potential solution, he said, could be encouraging businesses to train their workers better. Apprenticeships could be another big part of this, as Claire Cain Miller wrote recently at the New York Times. Meanwhile, those high-skill jobs are only going to keep growing, potentially faster than the number of people qualified to perform them, as Georgetown's CEW projects. If that's true, finding a way to better help people pay for college could be an essential part of any jobs plan. And not everyone can or will have those middle- and high-skill jobs; those low-skill jobs are set to just keep growing. That could mean putting in place better supports for people at the bottom of the income spectrum: a higher minimum wage, an expanded earned income tax credit, and paid leave are all examples Holzer gives. Trump has proposed a paid leave plan, but that can't start until he's taken office and gets legislation through Congress. 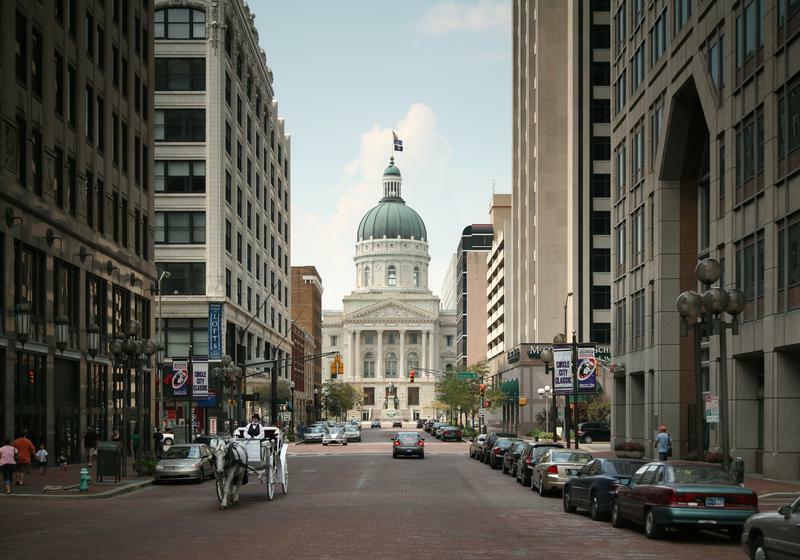 And that process will take much, much longer longer than convincing a single company to keep a single factory in the U.S.
After weeks of speculation, presumptive GOP nominee Donald Trump tweeted Friday morning that he has chosen Indiana Gov. 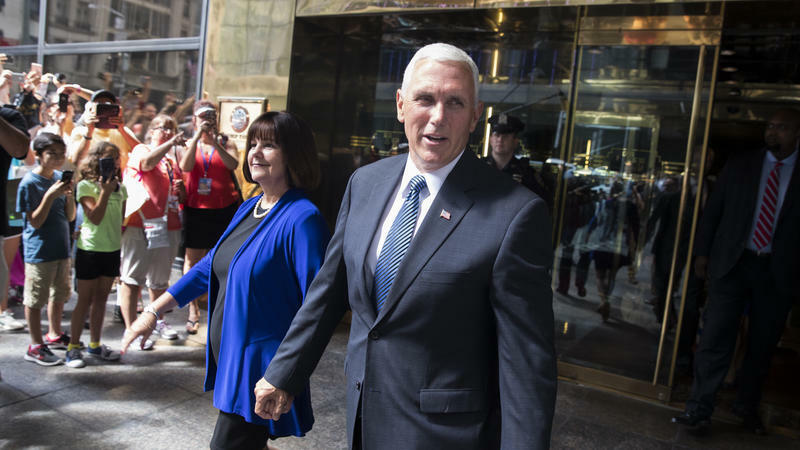 Mike Pence as his vice presidential running mate. Trump had planned to hold a press conference Friday morning, but he canceled that after a deadly attack in France. He has now scheduled a news conference for Saturday at 11 a.m in New York City. Pence quote-tweeted Trump's announcement, adding that he is "honored" to join the ticket and "work to make America great again." 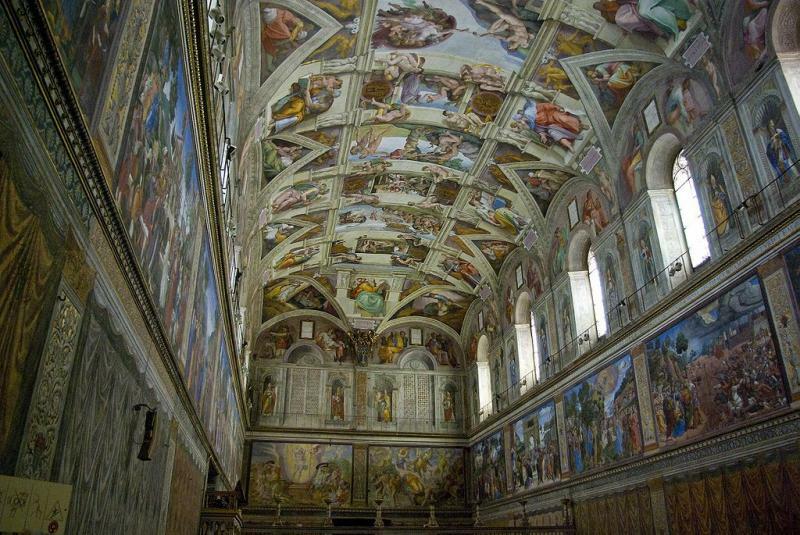 Farmington-based Carrier is to install a new heating, ventilation and air conditioning system in the Sistine Chapel as part of an effort to preserve the frescoes of Michelangelo.